This is the downloadable PDF version of Clawhammer Banjo ~ Tunes, Tips & Jamming You can read it on your computer or other device, and also print it out. Includes 2 files containing the PDF and instructional MP3s. Unlike the physical copy of the book, this PDF has color photos! 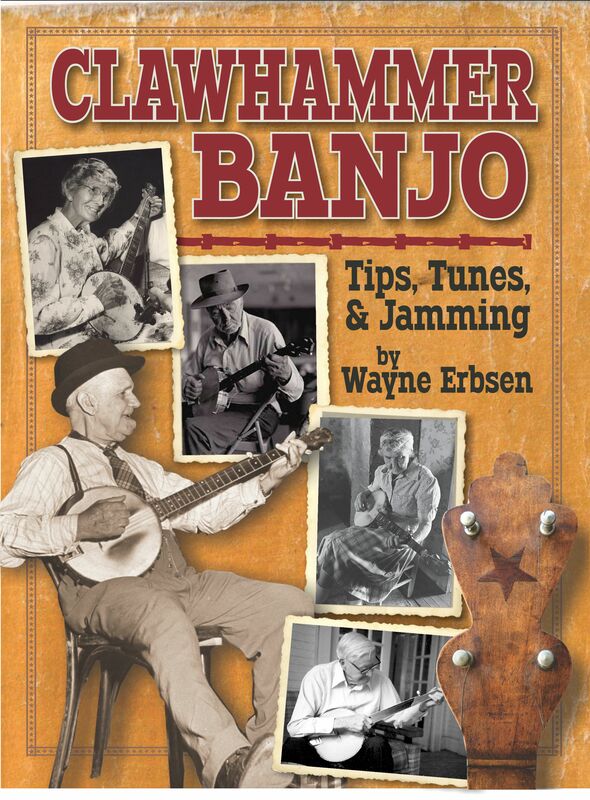 Wayne’s newest clawhammer book has something for everyone: beginners, intermediate and advanced players. Includes tabs and lyrics to 40 old-time banjo tunes, plus tips on learning tunes on the fly, how to jam, the art of faking it, and improvising. You WILL learn to play: Barlow Knife, Big-Eyed Rabbit, Black-Eyed Susie, Blackest Crow, Boll Weevil, Chilly Winds, Cumberland Gap, Dance All Night, Danville Girl, East Virginia, Fall on My Knees, Free Little Bird, Georgia Railroad, Greasy Coat, Gum Tree Canoe, Hangman’s Reel, Hang Me, I’ve Endured, Lazy John, Leather Britches, Let Me Fall, Log Cabin Blues, Lonesome John, Mole in the Ground, Needlecase, Oh My Little Darling, Old Plank Road, Puncheon Floor, Rabbit in a Log, Raleigh & Spencer, Rock That Cradle Lucy, Rock That Cradle Joe, Sandy Boys, Sad-Eyed Sadie, Senica Square Dance, Shady Grove, Shortenin’ Bread, Soldier’s Joy, Stay All Night, Sugar in the Gourd, Tater Patch, Texas Gals, Warfare, Whiskey Before Breakfast. 120 pages, PDF. Comes with instructional MP3s. I had high expectations for this book after picking up the Clawhammer for the Complete Ignoramus back over Christmas. I was not disappointed. Great book Mr. Erbsen! Learned to play Wildwood Flower from the clawhammer form Ignaramus book 3 years ago, but have not been able to learn more…..
Give this book a try and you’ll surely be able to learn a lot more! Have fun pickin’.